We Fix Clogs, Dents, Drips, and More! First off, clogged gutters are useless. They spill over and can potentially ruin the lawn/garden beneath, your siding, and – in worst-case scenarios – your foundation! If your gutters look like this, don’t be embarrassed – we totally understand how difficult of a job cleaning gutters can be. Whether your gutters are inaccessible, too high/ out-of-reach, or its just to “icky” for you, give us a call. 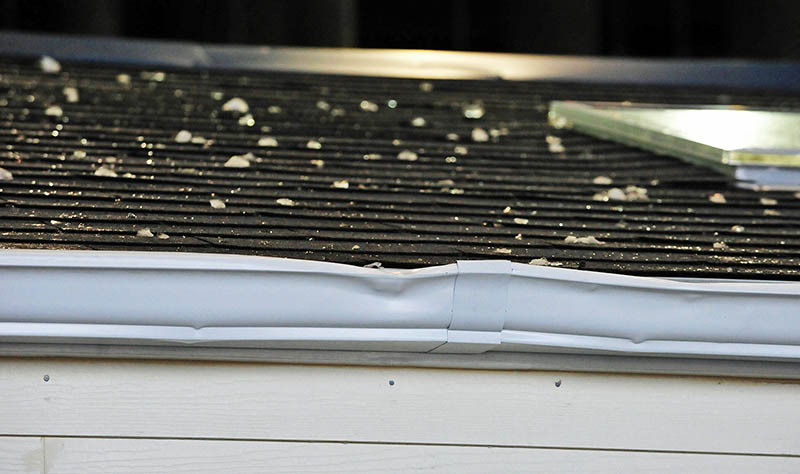 Our certified and insured experts will use the proper equipment to make your regular gutter maintenance a breeze! Are Your Gutters sagging? Leaking? Clogged? Whether you need a simple cleaning to unclog your gutters, or a full gutter installation, we are the professionals for you. Pro-Line Contractors installs, repairs, and maintains gutters on building of all shapes and sizes. Give us a call today for a FREE estimate on your gutter repair! Don’t Have A Clue What’s Going On Up There? If you have any sort of roof or gutter problem, we will gladly inspect to insure your gutters are properly secured to your home and that your roof is up to code. You can schedule a FREE inspection for your gutter repair right now. Call us today at 708-479-1237 or Request An Estimate from our certified experts. Damaged gutters do not perform their intended jobs well. If a gutter becomes loose from your house, damaged from hail, or are not properly maintained, they will not catch the runoff from your roof and send it away from your house as intended. The gutters and downspout on your house should force the rainwater (or melting snow) AWAY from the foundation of your house. Any house can become VERY easily damaged if water collects at its base. Freezing, thawing, and erosion of your foundation can take place if your house does not have proper drainage. We take care of all aspects of your roof, from your gutters to shingles. The professional at Pro-Line are expert handymen and engineers. Our experienced staff can ensure your gutters set up properly and efficiently. Not sure if your gutters are in need of repair? Call us today at 708-479-1237 or Request An Estimate from our trained professionals. Even your gutter can now have many luxurious features to make gutter maintenance and repair and little easier for you. Hinged downspouts – so you can easily lift the gutter out of the way when mowing the lawn! Copper downspouts – Copper downspouts are a new trend that we think looks chic and vintage on any house. Gutter Guards – A necessity if your home is near a wooded area, but a luxury feature elsewhere. Gutter guards keep leaves and debris out of your gutter to prevent clogs from forming. Copyright © 2019 Pro-Line Contractors, Inc. All Rights Reserved.